Monarch Air Group provides private air charter in Colombia. Our clients benefit from top-notch service, unrelenting dedication to safety, wide selection of aircraft, and years of experience in chartering private jets. To obtain a free quote, please use our online quoting tool provided below, or call toll free 1-877-281-3051. Monarch Air Group offers private jet charter services to and from Colombia. 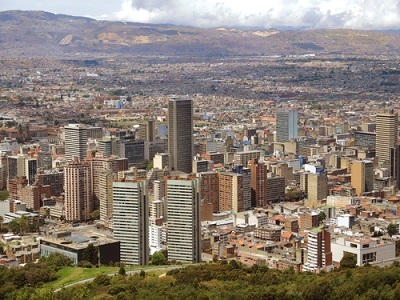 Colombia is a country that is situated in northwestern South America. It is has the population more than 46 million people and is the 27th largest country in the world by population. The country’s economy is mainly based on producing coffee, emeralds, flowers, oil, and coal. Colombia is a very enjoyable travel destination that attracts both business and leisure travelers worldwide. The most notable tourist attractions in Colombia are the walled city and beaches of Cartagena, the historic Candelaria district of central Bogotá, the colonial towns of Santa Fe de Antioquia, Villa de Leyva and Santa Cruz de Mompox, Popayán, the Las Lajas Sanctuary and the Salt Cathedral of Zipaquirá, and many others. The main airports include Jose Maria Cordova International Airport, El Dorado International Airport, Alfonso Bonilla Aragon International Airport, Ernesto Cortissoz International Airport, Rafael Nuñez International Airport, and Matecaña International Airport. 1. API, Apiay, Apiay, Colombia. 2. BOG, Eldorado International, Bogota, Colombia. 3. CIO, MCAL Lopez, Concepcion, Colombia. 4. GIR, Girardot, Girardot, Colombia. 5. IBE, Ibague, Ibague, Colombia. 6. LAT, La Uribe, La Uribe, Colombia. 7. MND, Medina, Medina, Colombia. 8. MQU, Mariquita, Mariquita, Colombia. 9. PAL, Palanquero, Palanquero, Colombia. 10. SJG, San Pedro Jagua, San Pedro Jagua, Colombia. 11. VVC, La Vanguardia, Villavicencio, Colombia.